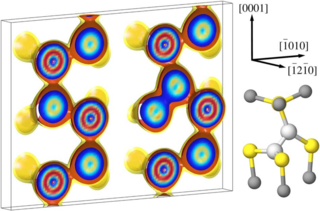 Intrinsic point defects in indium oxide, including vacancies, interstitials as well as antisites, are studied by means of first-principles calculations within density functional theory using the generalized gradient approximation together with on-site corrections. Finite-size effects are corrected by an extrapolation procedure in order to obtain defect formation energies at infinite dilution. The results show that all intrinsic donor defects have shallow states and are capable of producing free electrons in the conduction band. This applies in particular to the oxygen vacancy. 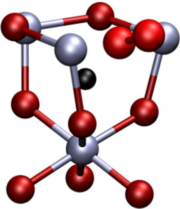 Since it has also a low formation energy, we find that the oxygen vacancy should be the major donor in this material explaining the n-type conductivity as well as the non-stoichiometry of indium oxide. In addition, we show that there are a wealth of oxygen dumbbell-like defects which are thermodynamically relevant under oxidizing conditions. 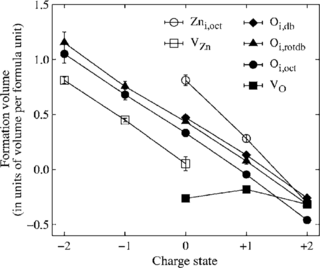 Finally, we discuss defect induced changes of the electronic structure.